In one of our recent classes on mass and momentum transfer, we studied qualitatively how blood drug concentrations vary after consuming a tablet containing that drug. The region 2 is what I was concerned with. Greater the difference between the actual drug concentration and the threshold concentration, higher are the chances of side effects. The drug will show effect at any concentration above the threshold. We said that the tablet-stomach acid interface were in equilibrium. So, the maximum achievable concentration of the drug at any point corresponds to the saturated solution of the drug in stomach acid. 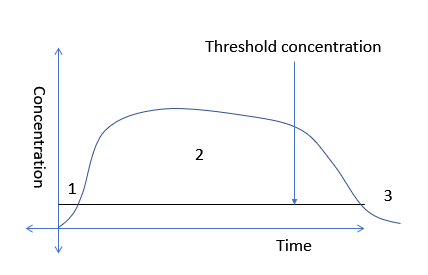 The concentration of the drug in blood will go on increasing depending on the value that corresponds to the saturated solution concentration. So, lower the saturation concentration, lower would the height of region 2 be. My question is: Is it possible to decrease the solubility of the drug by adding another substance in the tablet, which is soluble in water? The thought process is - The soluble additive and the drug, both, will dissolve in water. The solution at the tablet-stomach acid interface will be saturated. The soluble additive will "engage" some water molecules. These water molecules will then not be available for the drug molecule to be solvated, reducing the saturation solubility of the drug and, sort of, solving the problem of the region 2. Is this a feasible idea? What calculations does one do to find this? Please consider this approach for solving the region 2 problem, though there are other solutions possible. The actual question bolded in your post must be answered with yes. There will most certainly be some compound that reduces the solubility of your drug in aquaeous solution. However, it is exceedingly unlikely that one of these compounds can be used in the way you intend. The most important reason is that drugs are typically consumed in tablets containing only some hundred micrograms of the active compound (or less). This is so far away from the solubility limit that you would need tens of grams of the other compound to cause some drug precipitation at all. These tens of grams will be far from harmless and would make pills non-consumable due to the much larger size. Not the answer you're looking for? Browse other questions tagged solubility drugs or ask your own question. How can I avoid crystallisation of sugars in vinegar at low temperatures?